Imagine being greeted by this sight after a long and insanely crappy day at work! It’s immature and so very silly, and it brought the biggest smile to my face. 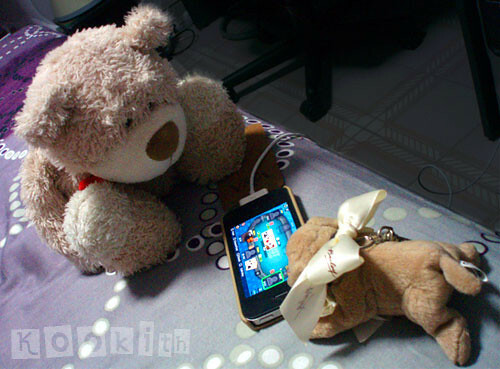 I couldn’t help but chuckle at the bizarre image of a ragged teddy bear and a tiny dog with a ridiculous bow, playing Texas Poker on the iPhone. Kinda like Toy Story come to life! Today is our second wedding anniversary. I am so thankful for my husband, who makes me laugh all the time, especially when I’m having a bad day. I neither need nor want flowers or expensive presents or declarations of unending love which are, in my opinion, frivolous and meaningless. I much prefer the hearty laughs and the sweet little gestures that never fail to brighten up my day. A wise friend once told me, “Marriage is really, really hard work, but it’s the best thing ever!“, and she’s spot on. I constantly remind myself not to take him for granted, and to remember just how incredibly lucky I am that he’s in my life. I feel so blessed, and I know that whatever life throws at us, we will face it together.